Cape Town is the undisputed jewel in South Africa’s crown. Synonymous with breathtaking scenery, world-class cuisine and thriving culture, there are endless ways to explore the Mother City—and you don’t have to ransack your savings account to do so. Part of the city’s charm is the fact that it’s accessible to everyone, with some of its top-rated attractions costing the equivalent of just a few dollars. Here are some of the best things to do in Cape Town for under USD $10 (approximately ZAR 135), ranging from unforgettable mountain hikes to cultural experiences in the city’s colorful historic districts. The Cape Peninsula is home to some of the country’s most awe-inspiring scenery. One of the very best ways to take it all in is to tour Chapman’s Peak Drive, an iconic road with a minimal per-vehicle toll. The road runs for 5.5 miles/ 9 kilometers along the western flank of Chapman’s Peak mountain, connecting the picturesque coastal villages of Hout Bay and Noordhoek. All along the way, lookout points and picnic sites provide panoramic views of the Constantiaberg mountains and the Atlantic Ocean from atop the road’s plunging cliffs. Keep an eye out for fishing boats plying their trade in the bay, or for baboons sunning themselves on the rocky outcrops above. Boulders Beach is located just outside Simon’s Town, another of the city’s picture-perfect coastal villages. It is home to a rare land-based African penguin colony, and provides a unique opportunity to see these lovable little birds up close. Now highly endangered, African penguins are endemic to Southern Africa and are well-adapted to life north of the Antarctic Circle. After paying a small conservation fee, the Boulders Beach walkway leads you through the colony, allowing you to see the penguins on their nests without disturbing their daily routine. From a viewing platform overlooking the beach, you can watch them swimming, fishing, mating and playing. Nestled against Table Mountain’s eastern slopes, Kirstenbosch National Botanical Garden is a veritable Eden in the heart of the city. Here, you’ll find plants from every region of Southern Africa spread out over 36 hectares of land. Spend lazy afternoons exploring the garden’s walkways, or picnicking on its verdant lawns. Fynbos, proteas and sugarbushes recreate the magic of the area’s UNESCO-protected Cape Floristic Region, while also providing sustenance for a host of colorful birds (including the Cape sugarbird and the orange-breasted sunbird). In summer, Kirstenbosch hosts outdoor concerts every Sunday evening, with tickets also priced around the $10 mark. Historically known as the Malay Quarter, the area between Signal Hill and Cape Town city centre is now referred to as Bo-Kaap. It is the cultural home of the city’s Cape Malay people, descendants of Malaysian and Indonesian slaves brought to South Africa by Dutch colonialists in the 1700s. Now, it is as famous for its steep cobbled streets and pastel-painted houses as it is for its proud Muslim culture. 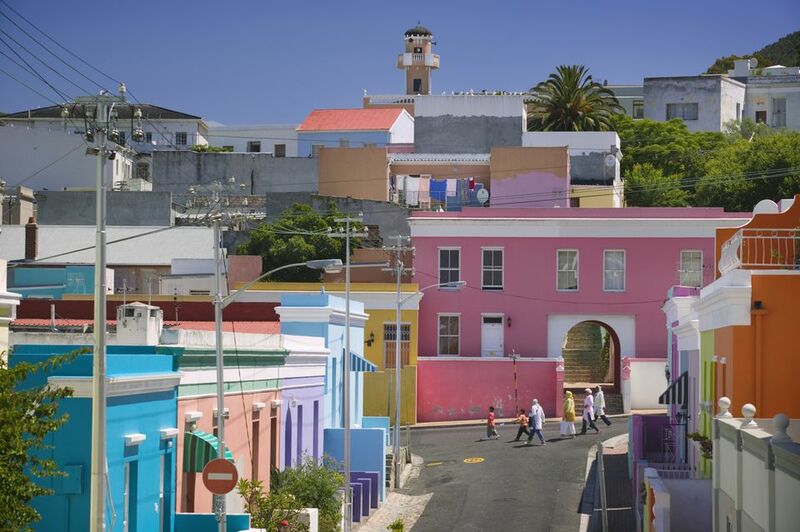 Join a free walking tour or explore the neighborhood on your own, visiting landmarks like Auwal Mosque (the first mosque built in South Africa) and the Bo-Kaap Museum. Make sure to stop in at a traditional restaurant to sample the spicy, fragrant flavors of Cape Malay cuisine. Despite being home to many of the city’s more expensive attractions (think Two Oceans Aquarium and tours to Robben Island), the V&A Waterfront is also a great place to take a stroll and soak up the atmosphere. Keep an eye out for street performers and impromptu live music shows, or stop to watch the fur seals sleeping on the jetties in the harbour. Covered craft market the Watershed is great for window-shopping, while the V&A Food Market sells inexpensive artisan treats from all over the world. Order your food to go, then spend a happy hour people-watching in Nobel Square, famous for its bronze statues of South Africa’s four Nobel Peace Prize laureates. This amazingly affordable museum tells the story of District Six, a municipal area once inhabited by an eclectic mix of immigrants, merchants and freed slaves. The area became a symbol of apartheid atrocities when it was designated as a whites-only area under the Group Areas Act of 1950. More than 60,000 District Six residents were forcibly removed, their homes bulldozed to ensure that they could not return. The museum tells the story of their suffering, and also sheds light on the area’s regeneration in the years since apartheid. It stands as a memorial of one of the darkest periods of South African history, but also as a fascinating testament to human endurance. If you don’t want to splurge on a cable-car ticket to the top of Table Mountain, consider hiking up nearby Lion’s Head instead. The hike to the summit takes approximately 1.5 hours, and can be challenging in places - at one point, you’ll need to ascend with the aid of steel ladders and chain hand-rails. However, it’s achievable for anyone of average fitness, and the view from the top is well worth the effort. You’ll be able to see Table Mountain in all its glory, as well as Cape Town, Table Bay and Robben Island spread out hundreds of meters below. Lion’s Head is especially famous for its full moon hikes, which give you a magical bird’s-eye view of the city and sea at night. The area around Cape Town is full of excellent surf spots, but Muizenberg is perhaps one of the most popular. Known for its consistent, relatively gentle waves, it’s a great place to take up the sport for the first time and is especially loved by longboarders and stand-up paddlers. Surfing the beach break is free, while a handful of local surf schools and shops offer affordable lessons and rentals. The vibe here is welcoming and relaxed, and local conservation group Shark Spotters operate a flag system to warn of shark activity in the bay. Although Muizenberg operates all year round, the waves are best in winter when the north-westerly blows and the swell picks up. Housed in an old factory near the beautiful Hout Bay waterfront, Bay Harbour Market is one of the best loved of Cape Town’s many markets. Held every Friday night, Saturday and Sunday, it boasts over 100 independent stalls selling an incredible array of locally produced food, fashion, crafts and decor. Entry is free, and it’s possible to fill up on global treats, buy yourself a quirky souvenir or sink a few pints at the bar for under $10. The market attracts people from all walks of life, and the atmosphere is both festive and eclectic. In winter, a huge fireplace keeps the chill at bay, while the Bay Harbour Sound Stage hosts local live acts all year round. With its white-painted façade and smart blue trim, the Blue Peter Hotel is much loved by Cape Town locals. The outdoor tables of its Lower Deck restaurant and bar offer one of the best views in the city, of Blouberg Beach, Table Bay and the unmistakeable outline of Table Mountain beyond. Come for a glass of wine or an affordable pub meal, then stay to watch Blouberg’s kitesurfers soaring over the bay at sunset. In summer, the party spills out onto the hotel’s rolling lawn, with visitors and locals alike gathering to soak up the sunshine and the sea air, and to keep an eye out for southern right whales passing through the bay on their annual migration.